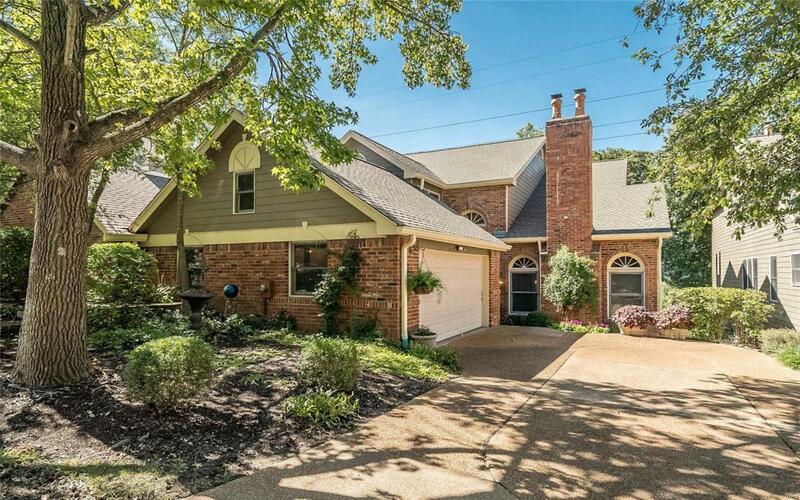 14379 Cedar Springs Drive, Town and Country, MO 63017 (#18075038) :: Hartmann Realtors Inc.
Welcoming Villa home that exudes warmth throughout the sizeable floorplan. The remodeled spacious kitchen was designed for entertaining from the large dining area & center island to the serving bar with wine cooler & ice maker that leads to the dining room. Abundant custom cabinetry provides all storage needs and under cabinet washer/dryer. Natural light drenches the sunroom and great room, both with vaulted ceilings. The main floor master suite has sitting room with gas fireplace and storage laden remodeled bathroom. Upstairs is a spacious loft, two bedrooms and a full bath. Walk out lower level has a rec room w/ fireplace, sleeping room, full bath, laundry room, workshop and storage. Privacy abounds and tree views from the optimum size deck and courtyard. Zoned HVAC and new main floor A/C unit. Cedar Springs $500 monthly assessment covers the manned gated entrance, community pool, clubhouse, tennis courts, exterior maintenance of the building, all snow removal, and total landscaping. Vitals Association Mgmt. Outside Management Creatd Prior 9/28/83 Resale Cert Reqd.